A new US Navy robot, about the weight and height of an adult male, may soon replace firefighters at sea: The humanlike SAFFiR has the ability to both detect dangerous environments and put out blazes. The Navy officially unveiled the latest version of its Shipboard Autonomous Firefighting Robot, or SAFFiR, this week, and says that the space-age creation could become a critical tool when it comes to battling blazes on water which are not easily accessible to humans. 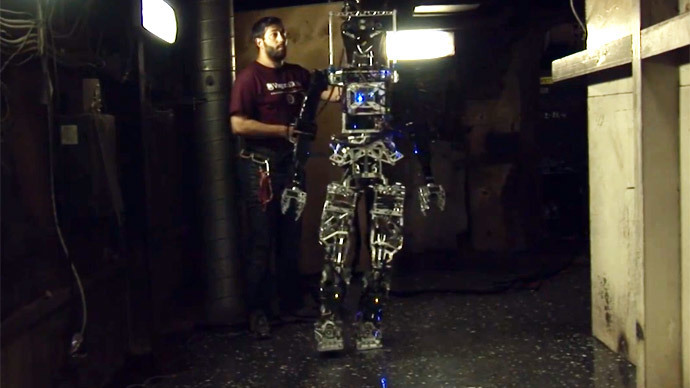 “So far we’ve demonstrated the fact that SAFFiR is capable of walking down a hallway and manipulating a fire hose to actually extinguish a fire,” John Seminatore, a graduate research assistant at Virginia Tech’s Terrestrial Robotics Engineering and Controls Lab, told RT. Video footage of the project shows that engineers at the ONR have come close to creating a human-like robot that’s capable of walking into open fires in the event of an onboard emergency. The balancing and control system used with SAFFiR allows the robot to walk on specialized surfaces, for example a moving deck of a ship that may be warped or far from flat. The prototype is affixed with state-of-the-art sensors to help it detect gasses and incipient fires, which can then be sent by way of up-to-the-second updates fed to human firefighters, according to the Navy. The robot’s “advanced human-robot interaction technologies, including gesture and natural language dialog,” is thought to make it ideal for teaming up with actual, human firefighters. In a press release published by the ONR Public Affairs Office on Wednesday this week, the robotics expert said scientists want to see what other capabilities that can program into the SAFFiR. “We have taken a look at other kinds of sensors that you can put on these robots,” he said. In the meantime, the robot appears to not be quite ready enough to take on tasks outside of a controlled environment. Engadget’s Mariella Moon noted that the blaze-battling automaton isn’t actual water – or fire – proof just yet, “which sounds like a recipe for disaster since it's [a] firefighting robot on a ship,” she wrote.